Do you know much about Saul who became Paul–like even what those names mean? Saul was a tent-maker from Tarsus who persecuted Christians before Jesus had him struck with blindness on the road to Damascus. What did Paul teach about the Ten Commandments? Did he teach they were “nailed to the cross” as some claim? Did he keep the biblical Holy Days? Did he teach keeping the Holy Days and obedience to God to the Gentiles? Was he an eloquent speaker? Did he feel the need to have to defend himself and his apostleship? What did Paul teach about love? Since Paul wrote Christians are to imitate him as he imitated Jesus, do you do that? Do you know enough about him to be able to do that? Dr. Thiel addresses these issues and more. Here is a link to the sermon: Paul: Apostle to the Gentiles. 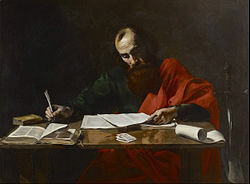 The Apostle Paul He was a later apostle, but also an early Christian leader. Here is a link to a related sermon: Paul: Apostle to the Gentiles.